Sure, you can always get away with gaming on your PC or Mac with their typical stock keyboards from your local electronics stores, but sometimes we need to take that extra step with buying one of the best gaming keyboards — you’re getting higher quality key-beds, stable construction, some color illumination, extra shortcut and macro keys to give us an edge in our game-flow, and an overall faster process in general. 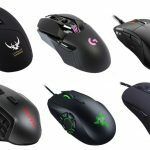 Just like in our gaming mouse guide, the best gaming keyboard for you will depend on only a few little factors, and today we made sure to review, compare and contrast the 10 best models on the planet to give you some choices when shopping around. In this category we find membrane and mechanical keyboards. Mechanical keyboards are more recommend for gaming, and they have a specific build that have switches under each key. These keyboards are the most long-lasting with performance that degrades a lot less over time. Due to their excellent characteristics in terms of build and construction, they are very popular among gamers. They are separated by the type of micro switches, which have different tactile characteristics that are designated by different colors (red, blue, black, brown, etc.). These keyboards are outstanding for users who need to not only hit keys quickly, but at the same time, are fast in typing and will deliver excellent speed which is simply impossible on other keyboards. When we’re gaming, we want optimization — and that’s what these specialized keyboards do. To us, upgrading your keyboard to a gaming-specific model is almost as important as buying a gaming headset — we’ll take anything that gives us that slight edge vs. our competitors. 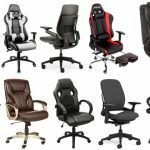 Budget – As compared to common keyboards for more leisure and office-work type of applications, some would consider these a lot more expensive. However, you’re getting what you pay for. 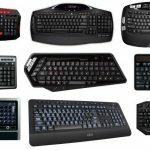 We found a few keyboards for gaming in different price-points to give you some options; however, the higher you go in price, the better the build and features it provides. Wired or wireless? We know many who recommend going wired since there’s always the possibility of losing connection at an important time in your game match, practice or competition. However, we also know some gamers who would never want to hassle with wires if they can. In that case, there are some high-quality wireless models out there as well, and this all depends on preference. We do focus mostly on wired in here, so you can read our best wireless gaming keyboard for the alternative. Macro keys – These are extra keys your keyboard will come with that allow you to customize based on individual preference. Some come with an entire new set of keys to be programmed, while others only allow the F keys and a few others. Do you play a game that the macro keys will come in handy with? Color illumination? It ultimately won’t do anything at all for your gaming skills or flow, but a lot of these come with some awesome RGB back lighting, brightness adjustment and even animation. Is this important to you? Extra features – Anti-ghosting, N-key rollover, Windows key deactivation, wrist pad, and more. Some of these come with bells and whistles you may like — we’ll list the highlights of each. The Razer Black Widow X Chroma is one of the best gaming keyboards in the market because of its overall build, quality, and capabilities it will bring our gaming flow. It has been designed specifically for gamers with some great extra features built-in to it — it delivers a much-needed swift response to give you a slight edge over competitors (Razer has some really nice, responsive and consistent feeling keys with their keyboards.) Besides swiftness there is also durability that might surprise you – you can count up to 80 million strokes without any negative effect on sensitivity, so it will be lasting quite a while. It comes with housing that is protected from debris and dirt in order to save the sensitive tabs and ensure their effectiveness (military grade metal construction). Aside from the premium key bed and construction, the most standout feature for some of you may be the coloring — all of the keys come with a programmable back light (about 16.8 million options of color combinations) so that the user can individually program the color palette per his or her individual interest. This may come in handy for remembering keys and shortcuts and it may not — we know many who would love to have some nice aesthetics and colors going while they play (nothing beats darkness surrounded by your monitors and gear), while others couldn’t care less, so it all depends on the gamer. The Razer BlackWidow X Chroma is one of the best keyboard for gaming options due to the amazing construction and feel of Razer’s keyboards — the fact that the keys have gold-plated contact points will ensure safe contact with every key as well as making this an investment that will last you many years if you take proper care of it. Up next, we have the Corsair Vengeance K95, and this is definitely another one of the best keyboards for gaming if you’re looking for a higher-end, speedy response as well as a model that gives us some of the best durability available today. It’s made of air-craft grade aluminum (anodized brushed) so no plastic here, and we love the wrist rest it gives us (some of you may be fans of them while others not). When it comes to lighting, you’ve got some super cool capability if you’re into it — the user can customize the lights under the keys as well as the brightness. Every individual key comes with a Cherry MX red mechanical switch (that ensures quick double and triple clicks) with 122 key rollover on USB (100% anti-ghosting). The Vengeance K95 is also equipped with an on-board memory to ensure some efficient gaming speed at all times and it has 18 “G-Keys” which gives us up to 108 custom macros if you’re into efficiency and customizing like us (you’d be surprised at how much it helps your gaming flow if you learn how to do it). The Corsair Vengeance K95 doesn’t really lack much and is considered one of the best gaming keyboards out there by many. If you wanted a high-end, premium keyboard for gaming, here’s the pick — just make sure it’s within your price-range. It was TechRadar’s number one pick for the best gaming keyboard. Logitech has quite a few gaming keyboards worth looking at and even though it was tough to pick their very best (we have another listed later), this one here is their highest rated in the market today. It comes equipped with interesting details such as a matte texture that removes fingerprints on the keys as well as a long-lasting braided cable. 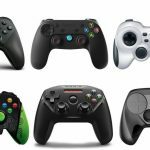 There are also some high-quality gaming necessities such as switches that will ensure nearly 50+ million keystrokes with some precise response. If you’re into it, the user can customize the background light under the keys as well as the key functions and you can control the media without exiting the game (play, mute, pause, volume adjust and song skip). Customization is big with this — F1 through F12 enables full macros button customization, however there aren’t any additional macro keys on the keyboard itself like a few other higher-end models out there, so keep that in mind. If you are looking for another one of the best gaming keyboards for the money, take into consideration the Logitech G610 Orion. It’s also a bit cheaper than the previously listed picks if you wanted to save some weight on your wallet. Here’s a brand we’ve all come to love, and their reputation for high-quality gaming gear continues to evolve as the years go by. This particular keyboard will enable you to personalize the gaming experience per your interest in regard to lighting choices for keys, integration in the game, and macro key creations – really one of the best keyboards out there for this if that was important in your checklist. There are 6 dedicated quick-access keys on the left and you can adjust the media (volume, brightness, etc.) with the F keys. The build of the keys are shaped well to enable swift gliding for strokes; the QS1 switch is especially nifty when it comes to speed of response. Overall, the Apex M800 comes with a low ergonomic angle design which enables quick movement between the keys (this especially comes in handy during long hours of action games). There’s zero ghosting and you can press simultaneous keys at once easily. Oh, there’s color customizing (full RGB LED) with 8 brightness levels as well if you’re into that (also some cool modes that creates some patterns with the lighting — not a must of course, but pretty cool if you ask us). The SteelSeries Apex M800 is one of the best gaming keyboards if you are specifically looking for speed and customization if it’s within your budget. Here’s a solid model if you’re specifically concerned with key quality. You have technology called “Full N-Key rollover” to ensure your keys pressed at once are read well, anti-ghosting and no inputting errors, some aluminum housing (sanded finish as well as grease coating resistance) as well as Win-Key deactivation. The unique gold cross-point precision module is built-in for all keys, which helps with the overall pressing experience and accuracy. There’s also a hand rest made of rubber that is equipped with a magnetic connection for quick snap action to help with comfort. The gamer can adjust the brightness of the red backlight and the keys come with a blue backlight when you are activating the keyboard (not as much color customizing here as the others but you’re getting some extra build features instead). Combined with the aluminum anodized housing and keys that are covered with coating that is fingerprint resistant, you are getting yourself one of the best keyboards for gaming in terms of construction. Most of all, the Cherry MX Board 6.0 brings something called ‘RealKey technology’ (their mechanism for analog linking of the keys to ensure no delays when you press them) to compete as one of the best gaming keyboards with a very responsive and rather unique design on top of it all. Here’s the other Logitech appearance we promised. It’s a bit of a step up as compared to their previous model listed and although it’ll cost some extra cash, will be worth it if you’re willing to spend it. It comes with a matte surface that keeps fingerprints away and a cable that is braided for extra durability. Like many others in this guide, the lighting of the keyboard is RGB premium (with 16.8 million colors) and the switches are extra swift, including sturdy ‘Romer-G mechanics’ (their new coined technology for an advanced mechanical switch that actuates at a distance of 1.5mm). 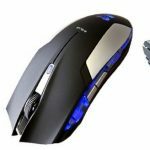 The Logitech G810 is also equipped with software that enables the user to customize keys per individual preferences, so you can set it up beforehand if you want to switch games and what not. The durability of the keyboard is proven at 70 million strokes, which will ensure long-lasting life of the keyboard even with many hours of passionate use (aka some hard typing if you’re upset or angry — don’t worry, we’ve been there). Lastly, another interesting element that makes this keyboard the best for gaming is the fact that it has three levels of angle adjustment; there is also multi-key input with rollover of 26 keys. 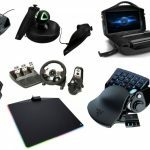 The Logitech G810 is another one of the best gaming keyboards by the brand due to its high-quality design and technology. We love Turtle Beach gaming gear and this particular keyboard is one of the higher-priced yet beastly models out there right now. It is durable and sturdy with steel reinforced housing that will protect key sensitivity from dirt and other pesky tarnishing effects. The key caps are laser engraved for smooth usage and easy transfer from one to the other, which comes very handy particularly during faster-paced gaming. The Impact 700 is one of the candidates for best gaming keyboard with its 6 rollover of keys and complete anti-ghosting mode that will additionally ensure smooth and precise control during the game even when you hit several keys at the same time, such as double and even triple clicks (they’re also backlit and the user can personalize the lighting according to their personal preferences). Grab the Turtle Beach Impact 700 gaming keyboard if you’re not only a fan of theirs but also want a high-end, premium model. It’s just listed down here towards the bottom since it doesn’t have many features that others don’t have for a cheaper price. The Thermaltake Poseidon Z is one of the best budget-friendly gaming keyboards out there (it made it as PCGamer’s pick for best budget gaming keyboard). If the previous picks were a bit too expensive for you and you’re into saving some cash yet still upgrading that gaming flow of yours, here’s the one. It is equipped (as stated as ‘eSports verified’, which is for some guaranteed swift tactile response) blue mechanical switches and 6 to 8 N-key roll over, which as we’ve learned will ensure precise usage even when the user clicks on several keys simultaneously. The keys come with backlighting and 4 brightness levels for a little customization as well. You’ve also got a nifty switch to disable Windows Key (has that ever happened to anybody else besides us?). Nothing too much more to rave about with this one, but again you’re saving some money and sacrificing some bells and whistles. If you are looking for the best keyboard for gaming that won’t cost you an arm and a leg, you can count on the Thermaltake Poseidon Z to deliver some pretty solid quality and durability, with proven functionality for more than 60 million keystrokes on top of it all. Here’s a gaming keyboard that brings us some decent features aside from the cool look. It is equipped with an LED backlight in red, some gaming mode controls, custom macro keys and complete N-key roll over which will equip us with a lot of the more common features we’ve seen thus far in the top models out there. The Poseidon Z comes with ‘Alpha-Zulu switches‘ for gaming that are gold-plated for additional durability as well as swift response — it’s their take on mechanical keys and although not quite the quality of let’s say Razer or Logitech, brings us some stability for sure. This is also at times considered one of the best keyboards for gaming for its sturdy quality – it has been tested for consistent tactile response for over 60 million strokes, which definitely gives it praise from us for longevity and investment-purposes. There are five macro keys that can be programmed and even 1 USB 2.0 pass through, and the function keys enable media controls without the need to ever leave the game. The Division Zero X40 is a high-quality keyboard with technical capabilities that definitely make it make a proud appearance in here among the other heavy-hitter brands. 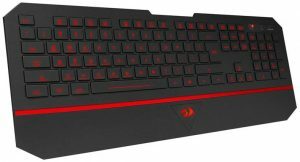 The Redragon Karura K502 is a solid keyboard for gamers looking to save as much money as possible while still upgrading a bit. It comes the usual 104 keys with pulsing LED lights that can be adjusted per individual interest. Among these, there are 12 multimedia keys, 19 non-conflict keys and the user can adjust input speed. In terms of construction, it isn’t necessarily made out of “military grade” aluminum like the expensive ones but it does have some enforced housing and a braided cable. The arrow and WASD keys are interchangeable, and win key can be turned off during gaming for complete control and prevention of obstruction during the most exciting gaming moments. 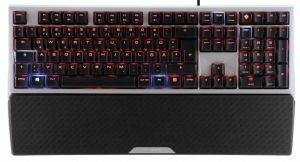 The Redragon Karura K502 tops off our list for no particular reason aside from the super cheap price, and we thought we’d stick it in here last to give you an option if you wanted something super affordable to look at before you decided your pick.